When a loved one is battling a fatal disease or is nearing the end of their lives, it is incredibly difficult to both grieve and assist them with their end-of-life needs. Families and friends are faced with a huge amount of difficult decisions, including where their sick loved one should spend the last days of their life while still receiving the proper medical care to possibly recover or pass away without pain and suffering. Hospice is a niche type of care for people fighting life-limiting illnesses, their friends and family, and their family caregivers. A hospice often offers services that treat the patient’s illness, assist with diminishing or relieving symptoms and pain, and addresses the emotional and spiritual needs of an ill person. Hospice care is usually a financially and overall better decision when faced with the options of hospitalization or placement in a nursing home. Palliative or hospice care services can be given within a special inpatient facility. In-home hospice care is also a popular option. The word ‘hospice’ can bring on negative imagery and instant feelings of ‘giving up’. We don’t usually think of hospice as a place where people go to recover, but rather to pass on. However, hospice and palliative care is more than that. Many care facilities, whether they are an inpatient hospice or a service that cares for someone in their own home, are dynamic in the sense that they continue to work to aid in the recovery of a patient if it satisfies their wishes. A dignified death is an option. Passing on from this world in a cold, white-walled hospital does not have to be your only option for your loved one. Hospice care offers alternative living situations that can be within a comfortable, warm hospice. Passing on in the comfort of your home is also an option. 70% of Americans say they would prefer to pass away in their own homes. With hospice care, this opportunity is a reality. Caregiver support. Whether your loved one will be living at home or in a hospice, caregiver support is an added helping hand to care with trained caregiving abilities for your loved one. A better financial option. Hospice care is often less expensive than nursing home care or hospital care. Comfort. Comfort is a big focus of hospice care. Is the idea of an in-home hospice or inpatient hospice starting to sound more appealing? If so, finding a reputable, caring, and professional facility is easier than you think. 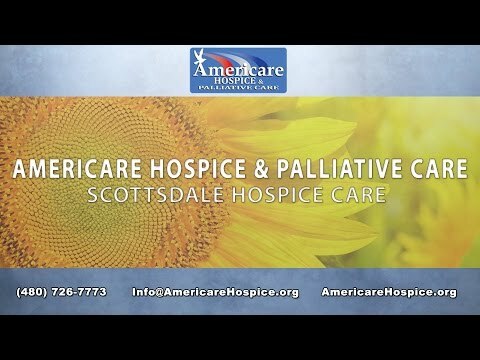 Americare Hospice and Palliative Care in Mesa is a faith-based organization that provides special care for those nearing the end of their lives due to incurable illness or old age. Americare Hospice focuses on the relief of symptoms and pain, making them one of the best choices for a comfortable, loving, and caring end-of-life transition. For hospice care in the North Scottsdale areas of Troon and Pinnacle Peak in 85262, 85255, 85259, and 85260, find comfort at Americare Hospice. When you need comfort and care in your home in the McCormick and Gainey Ranch areas or 85258, 85250, and 85256, contact Americare Hospice. When you need compassionate hospice care in the Central Scottsdale areas of 85251 and 85257, contact the professionals at Americare Hospice & Palliative Care.